In the Caribbean region, a high prevalence of vector-borne diseases and frequent cross-border travel challenge these small nations’ abilities to prevent, detect, and respond to global health threats. A single outbreak can have devastating effects on such countries, and can easily and immediately spread from one country to another. At the upcoming Caribbean Community (CARICOM) Conference of the Heads of Government meeting this summer, leaders of CARICOM Member States will consider strengthening the region’s ability to tackle this important issue through the means of a five-year regionally coordinated global health security roadmap. The Global Health Security Agenda (GHSA) – a partnership of nations, international organizations, and stakeholders – was created in 2014 through a shared understanding of the “essential need for a multilateral and multi-sectoral approach to strengthen both the global capacity and nations’ capacity to prevent, detect, and respond to infectious diseases threats.” Since then, more than a dozen countries have drafted roadmaps to strengthen global health security at a national level. In November 2016, the Caribbean region took the established roadmap one step further. 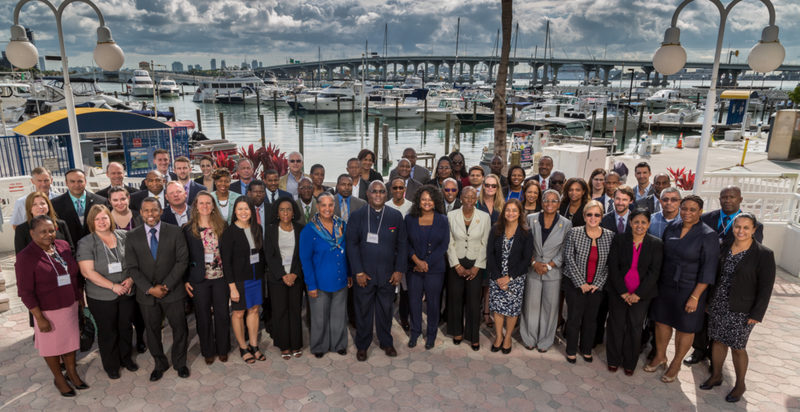 More than 70 participants representing 11 Caribbean countries, several regional bodies, the private sector, and development partners gathered in Miami, Florida to develop the first regional-level GHSA Roadmap. By the end of the workshop, participants had completed an internal self-assessment of the region’s capacities based on the Joint External Evaluation (JEE) tool and a first draft of the regional GHSA roadmap. Participants reported that they developed a stronger understanding of global health security and stronger cross-sector ties among Caribbean stakeholders. United States Centers for Disease Control and Prevention (CDC) Public Health Advisor Dr. Michael Mahar praised the progress made at the workshop, writing that it “brought in a more diverse range of participating organizations than any previous GHSA meeting.” The Roadmap is organized according to 19 capacities for health security, with each of the 19 having a five-year target, indicators by which to measure progress, institutions responsible, and lists of baseline assessment, planning and evaluation activities to support successful implementation. The GHSA Caribbean process is jointly led by the CARICOM Health Desk and Caribbean Public Health Agency (CARPHA). Throughout the week-long workshop, participants worked in highly interactive sessions to discuss the Caribbean’s current capability to prevent, detect, and respond to global health threats, and identify specific and actionable steps to improve capabilities further. For this process, participants were grouped by technical expertise to encourage in-depth evaluation of key milestones and activities. Each group focused on writing sections of the roadmap that encompassed areas of their expertise, but rotated briefly through all technical areas to encourage cross-sector participation. Common threads and challenges appeared early in the workshop. The problem of private yachts docking illegally, for instance, came up several times, as did legislative barriers that occurred when dealing with sovereign countries versus territories. Participants also shared success stories, such as lab accreditations and successful outbreak management, which energized and informed participants of one another’s accomplishments. Representatives from the One Health, One Caribbean, One Love initiative explained the importance of developing and following a multi-sectoral approach that broadens the conversation from traditional public health areas to encompass zoonotic threats and environmental concerns as well. Through this process, Caribbean organizations and representatives realized the need for multisector participation and cross-sharing of information. Representing a host of national governments, island territories, corporations, development agencies, academic institutions, and non-profits, this diverse group focused on strengthening global health security in the Caribbean region. The workshop was facilitated by the USAID-funded Health Finance and Governance (HFG) project on November 14-18th. Notable attendees included: US Ambassador Bonnie Jenkins, Coordinator for Threat Reduction Programs, United States Department of State; Rear Admiral Jordan Tappero, CDC; Dr. Rudolph Cummings, Programme Manager, CARICOM; Dr. James Hospedales, Executive Director, CARPHA; Mr. Ronald Jackson, Executive Director, Caribbean Disaster Emergency Management Agency (CDEMA); Mr. L. Simeon Collins, Executive Director, Caribbean Agricultural Health and Food Safety Agency (CAHFSA), and Dr. Justin Ram, Director of Economics, Caribbean Development Bank. With a first draft well underway, CARPHA and CARICOM will present the Roadmap to a regional meeting of Chief Medical Officers in April 2017, with the objective to present a final version consideration an upcoming CARICOM Heads of State meeting in the spring of 2017. The GHSA Caribbean process is jointly led by the CARICOM Health Desk and CARPHA. The U.S. Government is supporting the process through the U.S. Department of State, the U.S. Centers for Disease Control and Prevention, the U.S. Department of Health and Human Services, the U.S. Department of Defense, U.S. Department of Agriculture, the Federal Bureau of Investigations, and the U.S. Agency for International Development.